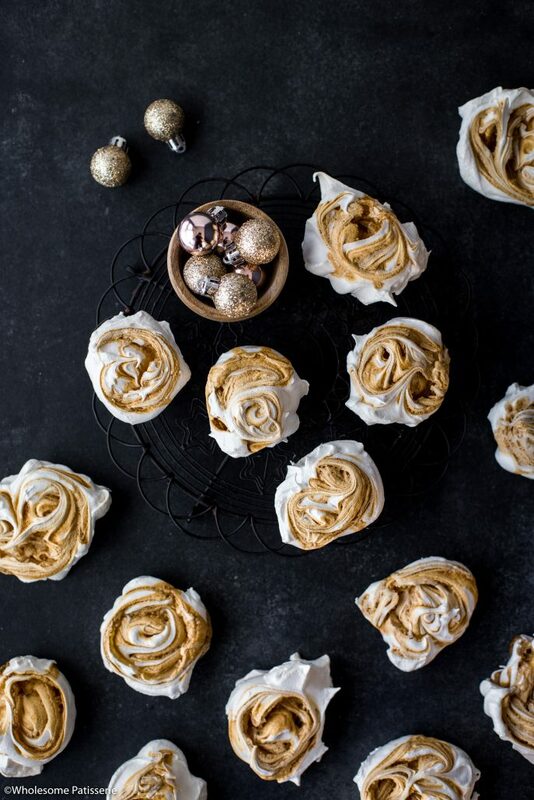 Is there anything that’s more Christmassy than to serve meringues? I don’t think so! Anyway that you make meringues are special, festive and delicious! 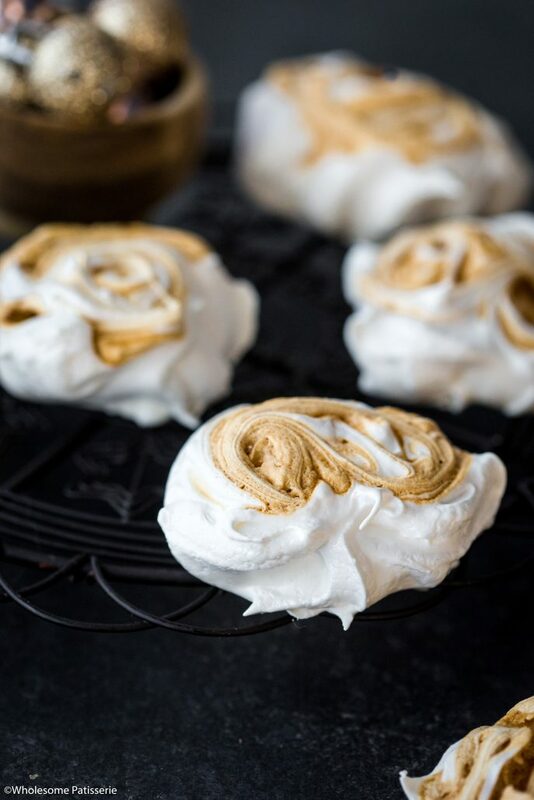 Today I’m sharing with you my recipe for homemade caramel swirl meringues! 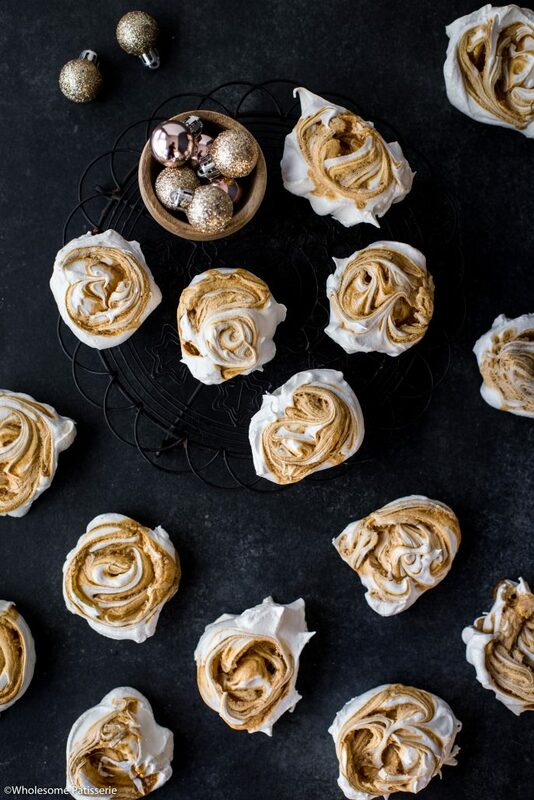 Don’t be afraid to let your inner baker out and whip up a batch of crispy meringues. 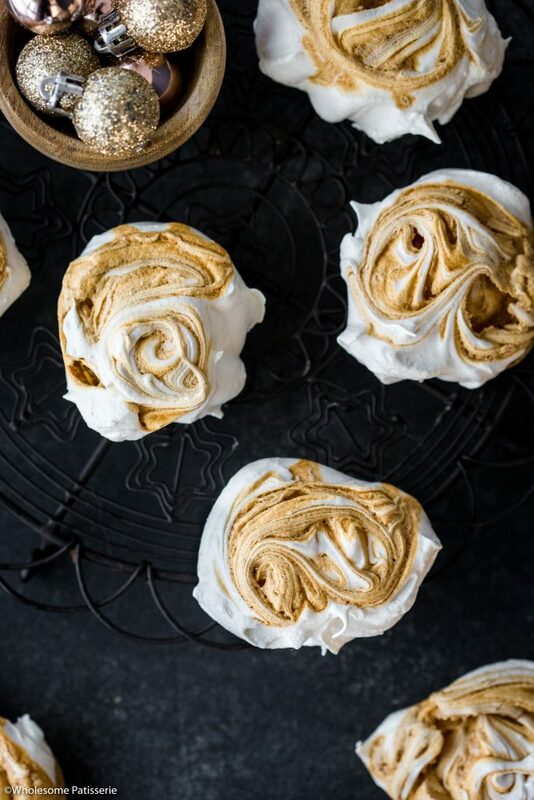 Making this meringue recipe is super simple, I promise you. The caramel sauce is also quick and easy to make. You can prepare your caramel sauce ahead of time and store it away in your jar so it’s made and ready! As you probably already know, meringues are best served fresh! If you’re going to be storing them for a little later, which you may want to with this particular recipe as it makes many meringues. Be sure to transfer your meringues into an airtight container, in a dark and dry pantry, for approximately 2-4 days. You’ll know when they are turning not so great when the sugar begins to melt away from the actual meringue and they won’t be crispy anymore. 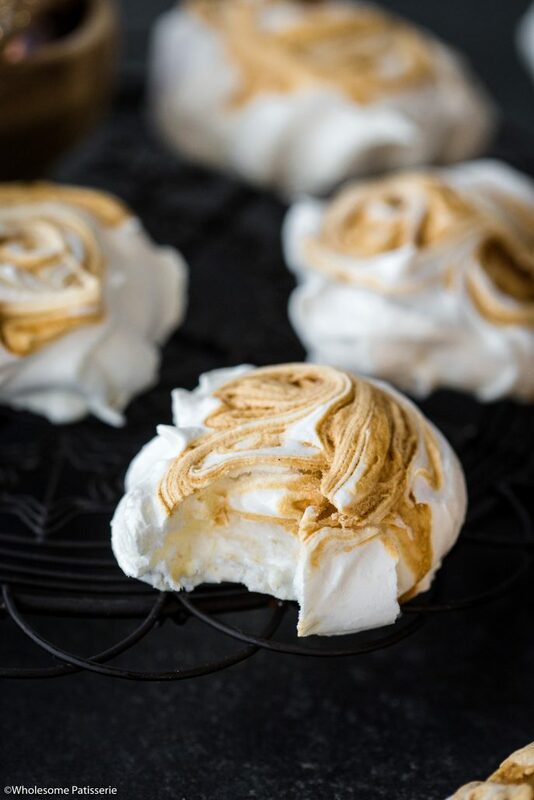 The caramel swirl in these meringues is seriously delightful paired with these crispy and airy meringues, I hope you enjoy! In a medium sized pot over low heat, combine cream, maple syrup, sugar and salt, mix well. Gently melt together until smooth. Increase heat to high and bring mixture to a boil, stirring occasionally. Once it has reached a boil, reduce heat to medium and cook for 5-6 minutes until it thickens, stirring to prevent burning. Once caramel has thickened and turn deep golden, remove from heat. Whisk through coconut oil and vanilla until well blended. Pour caramel into a heat-proof glass jar (such as a mason jar) and set in the refrigerator. NOTE: before whipping egg whites, ensure the mixing bowl and electric beater/whisk attachment you’re using are both thoroughly clean and completely dry from any grease, dust and water. This will ensure optimal results for meringue. Pre-heat oven to 150ºC (302ºF). Line a large baking tray or 2 baking trays with parchment paper and set aside. Ensure egg whites are at room temperature before whipping. NOTE: make sure there is zero bits of egg yolk in the egg whites, otherwise the egg whites won’t whip properly. Use a large bowl stand mixer attached with a whip. Or a large mixing bowl using a hand electric beater. Add egg whites to mixing bowl. Have sugar measured out and ready to go. Start whipping on medium speed to gradually aerate egg whites. Whip until egg whites reach soft peaks. Soft peaks = tip will curl and slowly fall back on itself. Once soft peaks have been reached, start to add sugar, 1 tablespoon at a time. Wait 30 seconds between each addition of sugar, to ensure the sugar dissolves. Once all the sugar has been added, check to see if it has been dissolved by rubbing a small amount of meringue between your fingers. It should feel smooth, if it feels gritty, continue whipping meringue in 2 minute increments until completely dissolved. Once sugar is dissolved, add white vinegar and beat meringue for a further 3 minutes or until stiff, glossy peaks. Peaks will hold their shape when lifted up. Spoon rounds of meringue onto lined baking trays. Remove caramel sauce from refrigerator and give it a good mix, until a smooth pouring consistency. Take a teaspoon of caramel sauce and dollop onto the centre of a meringue. Take a wooden skewer and gently swirl caramel into meringue. Repeat with remaining meringues. Place tray/s in oven and reduce heat to 120ºC (248ºF). Bake for 1 hour and 30 minutes or until the outside of the meringues are crisp and firm. 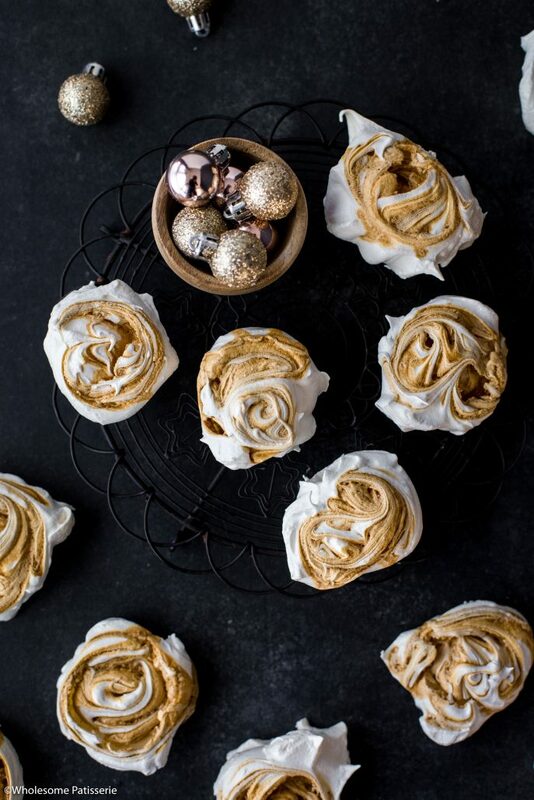 Turn oven off and leave meringues in the oven to cool completely, approx. 2-3 hours or overnight. Once cooled, remove from oven and serve. Or store in an airtight container, in the pantry, for 3-4 days.